A series of explosions have rocked churches and high-end hotels in Sri Lanka, killing more than 100 people and injuring hundreds on Easter Sunday. Jarrell Miller's promoter has claimed her fighter is being "nailed to a cross" for failing a drugs test only "because he is an African-American fighter". Miller was set to fight Anthony Joshua in New York on June 1 but earlier this week the Voluntary Anti-Doping Association (VADA) informed both fighters' camps of an adverse finding in a drug-testing sample, leading to him being denied a licence for the date at Madison Square Garden. Miller retained the right to request a further sample and to reapply for that licence to challenge Joshua in what will be the champion's US debut. 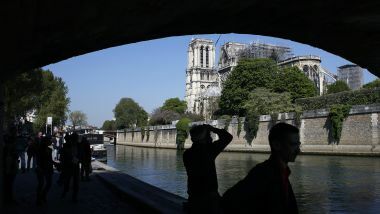 PARIS (AP) - For many yellow vest protesters, the stinging sadness that came with the devastating fire at Notre Dame Cathedral has quickly given way to boiling anger.